As anyone who has tried to record close vocals will know, a pop screen is an essential part of the signal path. The aim is to trap those powerful plosive blasts produced by Ps and Bs, preventing them from reaching the microphone capsule where they would typically cause massive and extended LF thumps, which can be troublesome to remove after the event. Prevention is definitely better than cure! Pop screens are available in myriad forms, from simple multi-layer fabric devices to woven or perforated metal grilles and, less commonly, open-cell foam. I've always found multi-layer fabric pop screens subtly — but audibly — dull, and to colour the vocal sound. In contrast, the woven-mesh and perforated metal screens tend to sound more neutral to my ears, but are inevitably more expensive, and their greater weight often causes 'gooseneck droopage'! I was introduced to the Håkan P110 pop screen a few years ago and was immediately impressed with the sonic transparency and anti-plosive effectiveness of its innovative open-cell foam. Moreover, the design is simple, elegant, hygienic and lightweight. The only problem back then was that it only came in one or two microphone-specific (Brauner and Gefell) mounting options. The P110 is manufactured by a Swedish company, Mikrofonen, and I'm pleased to report that, in addition to a 'universal' model, a new 'gooseneck' version has just been introduced. The latter has been a very long time in coming, but should prove extremely popular and makes the P110 a very practical and desirable pop-screen. All variants of the Håkan P110 Pop Killer employ a disc of relatively coarse and hydrophobic, open-cell foam as the plosive-trapping element, measuring 110mm in diameter and 20mm thick. This is supported within a simple U-shaped wire frame that traps the edges of the foam disc to hold it securely in place, while also allowing the disc to be removed in an instant for washing, if necessary. Hydrophobic foam will not absorb moisture from a vocalist's breath, of course, which is a good thing from both the sonic and hygienic perspectives! The wire and mounting brackets are painted black as standard, but a silver finish is available as an option. The universal model has a captive 3/8-inch threaded socket welded to the base of the wire frame so that the Pop Killer can be mounted directly onto a mic stand or stereo bar. 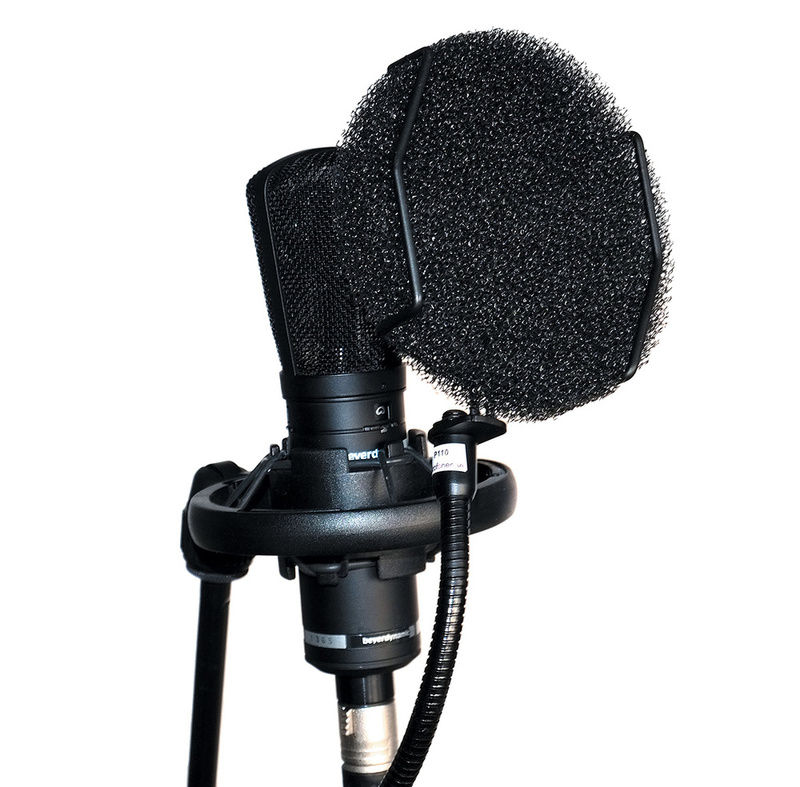 The new gooseneck version has a 300mm gooseneck bolted to the base of the wire frame instead, with a screw-clamp arrangement at the bottom of the flexible neck to fix around a mic stand or boom arm in the usual way. The gooseneck itself is fairly stiff and the Pop Killer frame and foam are so light that drooping shouldn't be a problem, even after years of use. The renowned mic suspension company Rycote adopted a similar open-cell foam pop-screen solution for their InVision Studio kit, which I take as confirmation of the technical excellence of this approach, but the Håkan P110 got there first, and it is now available in more versatile mounting options. To my ears the P110 is completely transparent and brilliantly effective, and the new gooseneck version is very easy to use with any microphone in any configuration. The P110 is a little more expensive than the typical budget fabric units, but less expensive than most metal options and a certain German mic manufacturer's bespoke model. However, it sounds more transparent than all of them and is far better engineered than most. If you are in need of a pop screen — and who isn't? — I can't recommend the Håkan P110 highly enough. P110 Universal & Gooseneck £48 each; replacement foam £19.20. Prices include VAT. P110 Universal & Gooseneck £48 (about $69) each; Replacement foam £19.20 (about $32).